Shop TC Electronic Hall of Fame Mini Reverb Guitar Pedal from AMS with 0% Interest Payment Plans and Free Shipping. 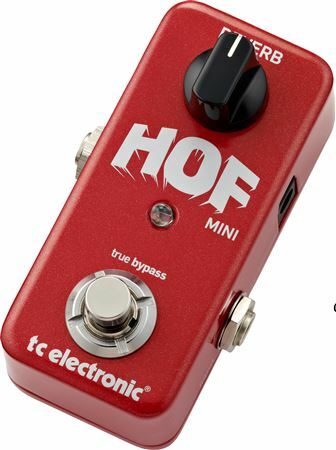 The TC Electronic Hall of Fame Mini Reverb Guitar Pedal provides all of TC’s best reverb in an ultra-compact design! TC Electronic pre-loads this amazing pedal with its legendary hall reverb but it is TonePrint enabled so you can load any reverb from the Hall of Fame reverb you want and sculpt the sound to your liking with the TonePrint Editor. You will not find a compact reverb pedal with more pro sounds and features than the Hall of Fame Mini! The Hall of Fame Mini comes pre-loaded with one of the very best; the legendary hall reverb. All of the amazing reverbs from their award-winning Hall of Fame reverb are also available as TonePrints and can easily be loaded into Hall Of Fame Mini. So whether you crave spring, hall, room, plate or the amazing lush cathedral reverb, you’re covered. Built on the renowned Mini platform, there’s always room on your pedalboard for this one, and the amount of tone choices never ends. What you get is a guitarist’s reverb that may remind you of guitar’s most heralded amps from yesteryear: one knob – awesome tone no matter what. TonePrints is the best of TC Electronic’s effects, customized from the ground up by the best artists out there. TonePrints give you access to an effect as it is used by the artist of your choice - so you can tap directly into the TC tones used by rock royalty and turn your stompbox into the signature pedal of your favorite axe-slinger – totally free of charge! The Hall Of Fame Mini pedal opens up the world of reverb to you like no other pedal ever could. You can beam your favorite TonePrints directly to your pedal via your smartphone, including all the default sounds of the original Hall Of Fame. Added to that, the TonePrint Editor allows you to shape, sculpt and form your ideal reverb from the ground up. Hall Of Fame Mini is super easy to understand. Just look at it. One knob for more or less reverb, and the option to use TonePrint. That’s it. But the sounds you can get span the entire history of reverb, from the original sounds of cavemen screaming into a canyon, to classic surf, lush 80’s ‘verbs, modern huge ambient washes and everything in between. way cool and super simple. It's like having a reverb know on my amp, but is has alot of programing options, but out of the box it is great with the defaults. I love how you can just zap different settings/sounds in this little unit with an app you put on your phone. So many sounds to preset sounds to choose and totally programmable. Lush!! I've been using the Paul Gilbert designed preset. I'm gonna put a few more of these on my board set up for different textures! You couldn't ask for such I high quality reverb with such ease. I tested this reverb pedal through my Fender Deluxe Reverb to get a side by side comparison, and this pedal matched the reverb in the amp very closely. I intend to use this with a Marshall JCM 900 since Marshall reverb seems non existant (at least to me). 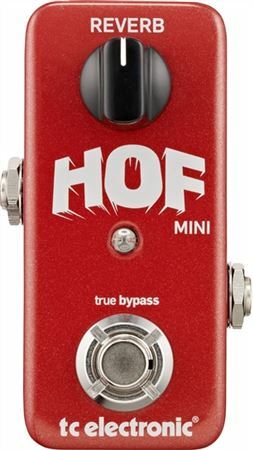 The HOF mini has way more to offer than it looks with it's lone knob. This is my second TC Electronic pedal. These Danes really know how to make exciting and musical effects. The die cast enclosure and knob are both sturdy and firm, and that soft-switch feels amazing. Whatever you want, you can get.